The alien-blasting, run-and-gun legend returns - complete with "the code"
Playing like a long-lost gem, Contra 4 recaptures the best of an era, while introducing today%26rsquo;s gamers to the real meaning of "challenge" (swearing like a sailor with no shore leave, if you can't stand tough games). Picking up where the SNES Contra 3: Alien Wars left off, Contra 4 is just as much a re-imagined remake as it is a sequel. Veteran players will recognize locations and enemies from the prior titles, making a run through feel like a trip down memory lane. Don%26rsquo;t be fooled though, because Contra 4 is just as difficult as its predecessors. This isn%26rsquo;t a game you%26rsquo;re going to best in one sitting. 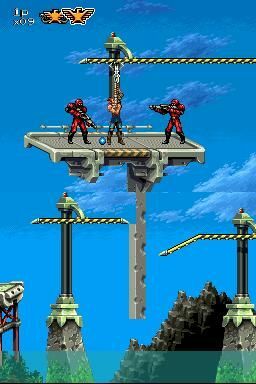 Visually, Contra 4 borrows heavily from what came before, adding a facelift to existing art but not drastically redoing any of the core sprites. It brings an immediate sense of familiarity as well as a renewed appreciation for sprite work. Our only real complaint with the visuals has to do with the dead space between the screens, which occasionally results in a cheap death from a hidden bullet. Description Finally, a retrospective done right - one-hit kills and game over screens galore. A must-have for DS owners.